When I first found out I was moving to an internationally recognized food city I was pretty excited for the great restaurants and food culture. But I’m learning that our UNESCO designation is not just about great tacos, but all that goes into them. Flowers and Bullets is a prime example of how, in Tucson, food is a means to pass on culture, push back against inequity, celebrate our place, and promote togetherness. Flowers and Bullets started with a couple of friends eager to engage with the needs of their community through hip hop, clothing design, murals, and other visual art founded by Dora Martinez, Jacob Robles, and Tito Romero. As the movement evolved and new collaborators were added, the roots began to spread out and sink a little deeper in the form of, well, literal roots. One of the struggles some of the founders experienced growing up in Barrio Centro was the lack of healthy food options in close proximity. This is a pervasive trend in lower-income neighborhoods, largely made up of men and women of color. There is a much higher number of liquor stores and fast food options and less healthy grocery stores and farmer’s markets (if any) in many of these neighborhoods. The Green movement that has popularized in recent years tends to be centered in wealthier, white neighborhoods. These ways of growing and procuring food feel new and innovative. But the original members of Flowers and Bullets recognize something that is essential for the neighborhoods that are getting left behind: these techniques aren’t new and they aren’t Anglo in origin. Instead, sustainable growing practices have been used to cultivate our land for centuries. Tucson is known as the longest, continuously cultivated land in North America, built on a 4,000-year-old farming village. The rich heritage of our food culture in Tucson that has been nationally recognized is due in large part to the way that men and women are learning from and carrying on the traditions of indigenous land cultivation. Flowers and Bullets has realized the beautiful opportunity here. Creating more green spaces in underserved neighborhoods simultaneously provides healthy food and serves as a source of connection to history and culture. The founders decided to begin where they had roots, in local neighborhoods. They jumped right in and planted about a dozen backyard gardens just in the first few months. Alfonso Chavez, the Art Crew Coordinator, talks about some of the essential practices they implement in these gardens. In addition to growing native foods, they “never use metals or plastics or anything harmful to the environment, rather are mindful of the land and what it offers and how we work in unison with the Earth rather than just take take take.” They have also installed rain water harvesting systems lead by Rachel Frank and Alaina Pierce, to incorporate this sustainable practice that has historically been used to utilize our most precious resource in the desert. The best thing about these installations is they are eligible for full reimbursement from the City! As they continue to establish backyard gardens in Barrio Centro, they are also preparing for a larger-scale project at the Julia Keen Elementary property. This school was closed in 2004 because of its direct proximity to Davis Monthan’s flight path. Cultivating this land as a larger-scale community crop production effort, will restore this site a source of life for the community. And they recently received the exciting news that they were awarded the Haury Grant which will enable them to hire on some of their faithful volunteers to get this project going! Alfonso Chavez, commenting on the collaborative nature of Flowers and Bullets said, “one thing that is crucial in community organizing is networking.” The wide range of the interests and talents of F&B members have made them a very interconnected organization. These partnerships have created an opportunity for mutual learning and growth. 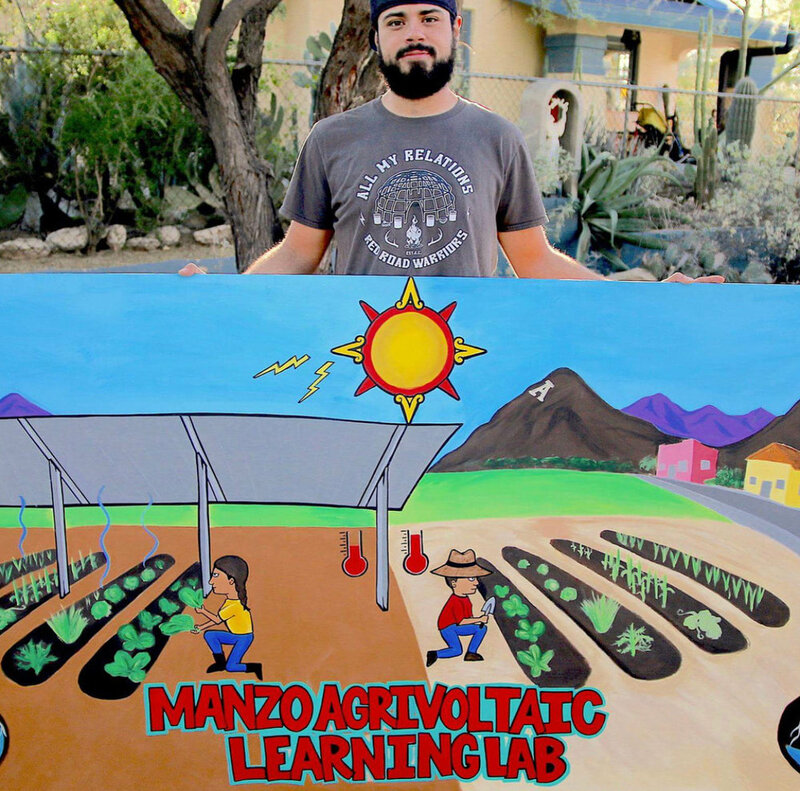 Alfonso volunteers on the San Xavier co-op farm on the Tohono O'odham Nation and is thankful for the way that they are able to champion a similar vision. He also was able to visit the Arizona State Prison in Tucson and bear witness to the creative work being done there. He was invited by Madeline Kiser who teaches environmental stewardship workshops inside the prison. Some of the men currently incarcerated have established a community garden to provide healthy alternatives to the food available to them. They gave a lesson on resiliency and native crop production. Alfonso was encouraged by their work and is looking forward to further collaborations with them. While Flowers and Bullets has been busy developing their agricultural arm, they haven’t abandoned their love for hip-hop and art. This is one of the central ways they are able to connect with the next generation and help to encourage the development of healthy cultural identity. They are involved in the Tucson Hip-Hop Festival and have led hip-hop lesson plans with youth to draw out ways that lyrics can bring awareness to some of the issues our cities are facing. A recent mural collaboration with the Boys and Girls Club- Steve Daru Clubhouse, is a great example of their creative approach to mentorship. When they were asked to do a mural to promote unity within the diversity within that neighborhood, they decided to begin by talking to the elders of the community. They learned about a powerful movement that took place in there back in 1972. This neighborhood didn’t have a park, sidewalks or a septic system. Through a series of marches, protests and meetings with city council members, the city granted their requests in the form of Joaquin Murrieta Park and El Rio Community Center. They talked with the kids about the importance of the protests and the significance of mural work in general. They taught them about natural color dyes native to our region that have been used for generations and the actual process of spray painting and creating murals. The kids then joined in to create the mural which depicted the protests alongside agricultural and cultural themes and the surrounding topography such as the Santa Cruz River. Whether it’s in the form of murals, clothing, hip-hop or community gardens, Flowers and Bullets is working towards a healthier, more connected community.